"Stutz" redirects here. For other uses, see Stutz (disambiguation). Stutz Motor Car Company of America, Inc. The Stutz Motor Car Company of America, Inc., was an American producer of sports and luxury cars based in Indianapolis, Indiana, USA. Production began in 1911 and ended in 1935. The brand reappeared in 1968 under the aegis of Stutz Motor Car of America, Inc., and with a newly defined modern retro-look. Although the company is still technically in existence sales of factory produced vehicles ceased in 1995. Throughout its history, Stutz was known as a producer of fast cars (America's first sports car) and, from 1924, luxury cars for the rich and famous. 2 Stutz Motor Car Company of America, Inc. 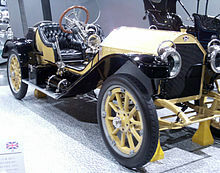 Ideal Motor Car Company, organised in June 1911 by Harry C. Stutz with his friend Henry F Campbell, began building Stutz cars in Indianapolis in 1911. They set this business up after a car built by Stutz in under five weeks and entered in the name of his Stutz Auto Parts Co was placed 11th in the Indianapolis 500 earning it the slogan "the car that made good in a day". Ideal built what amounted to copies of the racecar with added fenders and lights and sold them with the model name Stutz Bearcat. Bear Cat being the name of the actual racecar. The Bearcat featured a 389cid Wisconsin brawny four-cylinder T-head engine with four valves per cylinder, one of the earliest multi-valve engines, matched with one of Harry Stutz's transaxles. Stutz Motor has also been credited with the development of "the underslung chassis", an invention that greatly enhanced the safety and cornering of motor vehicles and one that is still in use today. Stutz' "White Squadron" race team won the 1913 and 1915 national championships before withdrawing from racing in October 1915. In June 1913 Ideal Motor Car Company changed its name to Stutz Motor Car Company (of Indiana) and Stutz Auto Parts Company (it manufactured Stutz's transaxle) was merged into it. To find new investment capital for expansion Stutz Motor Car Company (of Indiana) was sold in 1916 to Stutz Motor Car Company of America Inc. under an agreement with a consortium to list the specially organized holding company's stock on the New York Stock Exchange. As a part of the listing process the number of cars produced and sold since 1912 was reported to potential investors to have been as follows: 1913, 759; 1914, 649; 1915, 1,079; 1916 (first six months) 874. Stutz, Campbell, Allan A. Ryan and four others were directors. Stutz was president and Allan A. Ryan vice-president. Harry Stutz left Stutz Motor July 1, 1919 and went off with Henry Campbell to establish his H. C. S. Motor Car Company and Stutz Fire Apparatus Company. Allan Aloysius Ryan (1880–1940), father of Allan A. Ryan Jr., was left in control of Stutz Motor. Ryan Sr., and friends attempted stock manipulation which in April 1920 proved disastrous. Stutz Motor was delisted. The Stutz Motor corner was the last publicly detected intentional corner on the New York Stock Exchange. Ryan Sr., was bankrupted in August 1922 and disinherited by his father, Thomas Fortune Ryan. Meanwhile two friends of Thomas Fortune Ryan found themselves with large parcels of Stutz stock, Charles Michael Schwab and Eugene Van Rensselaer Thayer, Jr. (1881–1937), president of Chase National Bank. 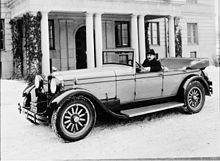 The new owners brought in Frederick Ewan Moskowics, formerly of Daimler-Motoren-Gesellschaft, Marmon, and Franklin, in 1923. Moskowics quickly refocused the company as a developer of safety cars, a recurring theme in the auto industry. In the case of Stutz, the car featured safety glass, a low center of gravity for better handling, and a hill-holding transmission called "Noback". One notable advance was the 1931 DOHC 32-valve in-line 8 called the "DV32" (DV for 'dual valve'). This was during the so-called "cylinders race" of the early 1930s, when makers of some expensive cars were rushing to produce multi-cylinder engines. Stutz Motor did not go to the V12 and V16 engines, but instead stayed true to its performance heritage with the dual overhead cam, in-line 8 design as used on the sporting cars of the era, such as Bugatti, Alfa, Duesenberg and Miller. Brochures boasted 100+mph. In 1927, a Stutz set a world record for speed, averaging 68 mph (109 km/h) for 24 hours. The following year, a 4.9-liter (300 in3) Stutz (entered and owned by wealthy French pilot and inventor Charles Weymann) in the hands of by Robert Bloch and Edouard Brisson finished second at the 24 Hours of Le Mans (losing to the 4.5-liter [270 in3] Bentley of Rubin and Barnato, despite losing top gear 90 minutes from the flag), the best result for an American car until 1966. That same year, development engineer and racing driver Frank Lockhart used a pair of supercharged 91-cubic-inch (1.49 l) DOHC engines in his Stutz Black Hawk Special streamliner LSR car, while Stutz set another speed record at Daytona Beach, reaching 106.53 mph (171.44 km/h) in the hands of Gil Anderson making it the fastest production car in America. Also in 1927, Stutz won the AAA Championship winning every race and every Stutz vehicle entered finished. In 1929, three Stutzes, with bodies designed by Gordon Buehrig, built by Weymann's U.S. subsidiary, and powered by a 155 hp (115 kW), 322-cubic-inch (5.28 l), supercharged, straight 8 ran at Le Mans, piloted by Edouard Brisson, George Eyston (of land speed racing fame), and co-drivers Philippe de Rothschild and Guy Bouriat; de Rothschild and Bouriat placed fifth after the other two cars fell out with split fuel tanks. Stutz Motor acquired the manufacturing rights for the Pak-Age-Car, a light delivery vehicle. 15 new Stutz models were introduced at the 1932 New York Motor Show by Charles Schwab including the Pak-Age-Car. The delivery vehicle was put into production by Stutz's Package Car Division in March and the production of automobiles stopped. When production ended in 1935 35,000 cars had been manufactured. Stutz Motor was hit by stock manipulation again in 1935 but without the spectacular numbers of 1920. Stutz Motor filed for bankruptcy in April 1937 though its assets exceeded its liabilities. Creditors were unable to agree on a plan for revival and in April 1939 the court ordered its liquidation. The former Indianapolis factory is today known as the Stutz Business Center and is home to more than eighty artists, sculptors, photographers, designers, architects, and craftsmen. Virgil Exner had more luck with the Stutz name. In August 1968, New York banker James O'Donnell raised funds and incorporated Stutz Motor Car of America. A prototype of Exner's Stutz Blackhawk was produced by Ghia, and the car debuted in 1970. All these cars used General Motors running gear, featuring perimeter-type chassis frames, automatic transmission, power steering and power brakes with discs at the front. They were lavishly furnished, with all possible luxury features such as electric windows, air conditioning, central locking, electric seats and leather upholstery. On the sedans there was typically a console for beverages in the rear seat. Engines were large V8s, originally 6.6 or 7.5 liters (400 or 460 in3) but by 1984 the Victoria, Blackhawk and Bearcat were using a 160-horsepower (120 kW), 5.736-liter (350.0 in3) unit and the Royale a 6.962-liter (424.8 in3) Oldsmobile unit developing a modest 180 horsepower (130 kW). This incarnation of Stutz had some reasonable success selling newly designed Blackhawks, Bearcats, Royale Limousines, IV Portes, and Victorias. Elvis Presley bought the first Blackhawk in 1971, and later purchased a further three. Frank Sinatra, Dean Martin, Evel Knievel, Barry White and Sammy Davis, Jr. all owned Stutz cars. The Stutz Blackhawk owned by Lucille Ball was for a time on display at the Imperial Palace Hotel and Casino Auto Collection in Las Vegas. However, owing to their extraordinary cost - Stutz was touted as the World's Most Expensive Car, a Royale limousine costing US$285,000 and a Blackhawk coupé over US$115,000 in 1984 (Ferrari 288 GTO was US$85,000 at that time) —production was very limited and it is believed only 617 cars were built during the company's first 25 years of existence (1971–95). 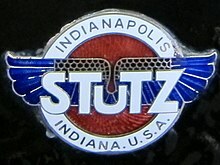 Sales of Stutz began to wane in 1985 and continued to do so on until 1995. Warren Liu became its main shareholder and took over ownership of Stutz Motor Car of America, Inc. in 1982. 1982 Stutz Victoria - This Victoria is the only one produced with side pipes. The Velvet Underground's 1970 song "Sweet Jane" includes the line "Riding a Stutz Bearcat, Jim/You know, those were different times..."
A short-lived 1971 American television series, Bearcats!, featured a Stutz Bearcat as part of the show's premise, although the actual cars used were replicas of a 1914 Bearcat custom-built by car customizer George Barris. In the 1989 American film Parenthood, Jason Robards' deadbeat son gives him a model car. Robards exclaims with great excitement "a Stutz!". In a September 2012 episode of Counting Cars, Barry White's former Stutz IV-Porte was found and renovated. In the Happy Days episode, "In the Name of Love", Howard Cunningham tells his son, Richie, about how Marion was in love with a man that "drove a Stutz Bearcat and wore a racoon skin coat" before they were married. On The Simpsons, Mr. Burns owns a 1936 Stutz Bearcat, and he, Homer Simpson, and Smithers used the car to get away from the FBI when they committed treason in the episode "The Trouble with Trillions". Grandmaster Flash and the Furious Five's 1979 song "Superrappin" includes the line "I will shock your mind in a new Star Stutz/And if a Stutz break down, I make another choice/I will dog my grill in a new Rolls Royce." Today Stutz models are very rare, as very few were produced, and are known to sell well over $100,000 worldwide through private collectors and auction. ^ Kettlewell, Mike (1974). "Le Mans". In Northey, Tom. World of Automobiles. vol. 10. London: Orbis Publishing. p. 1176. ^ a b Wise, David Burgess (1974). "Stutz". In Northey, Tom. World of Automobiles. vol. 19. London: Orbis Publishing. p. 2230. ^ Twite, Mike (1974). "Frank Lockhart". In Northey, Tom. World of Automobiles. vol. 11. London: Orbis Publishing. p. 1210. ^ "Counting Cars Full Episodes, Video & More - HISTORY". "The Stutz Club Online". Stutzclub.org. Retrieved March 1, 2005. 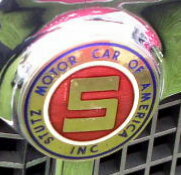 "STUTZ Motor Car Of America, Inc. (SMCA)". stutzmotor.com. Retrieved 2011-12-11.